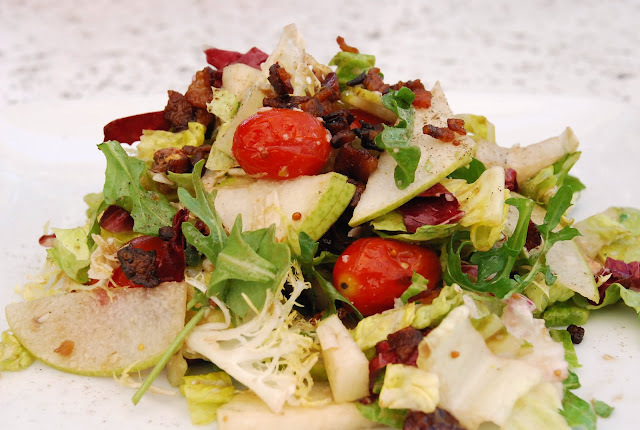 Italian Salads are never boring and Insalata Rustica is a perfect case in point. This is a simple salad to make and the combination of ingredients is remarkable. It’s also a beautiful salad to look at and I stared at it for an extended period of time before I decided that I just needed to dive in. Did I also tell you that this salad is delicious? I LOVE the flavor of the crispy pancetta and always end up doubling this ingredient when I make it. Fry pancetta and drain. Crumble and set aside. On top of the greens, add cherries, pears, and pecans. Top with crispy pancetta and dressing of aged balsamic.